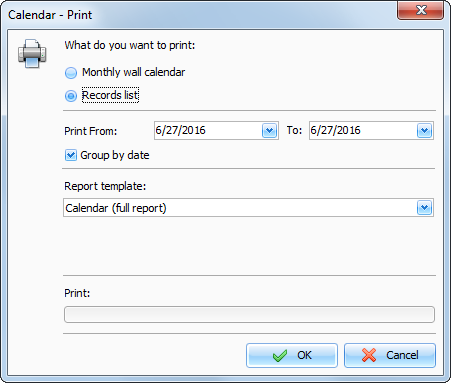 To print your information or a calendar, click the "Print" button or use the Ctrl + P shortcut in the main window. A print dialog box will appear. In this window are available two main print options: "Print calendar" and "Print records list". 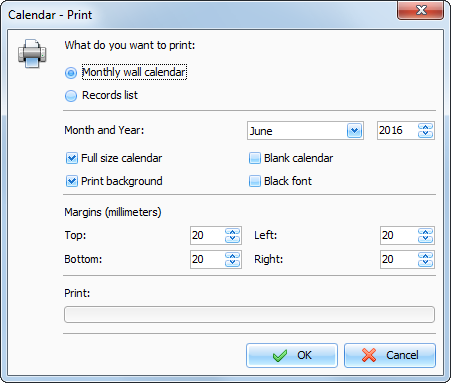 Full size calendar - When this options is turned on, the calendar will be stretched to fit the print area. Print background - will print desktop background picture. Blank calendar - the entries won't be printed if this option is turned on. Black font - all font colors in the calendar will be replaced with the black color. This options is useful if you will print without background, for example. Margins - select margins of the print area. After setting all desired options, click the "OK button. Calendar will be printed. Print From ... To - the dates range for printing. Group by date - when this option is turned on, the days will be separated. Report template - here you can choose one of available print templates. After setting all desired options, click the "OK button. "Print Preview" window will be opened.